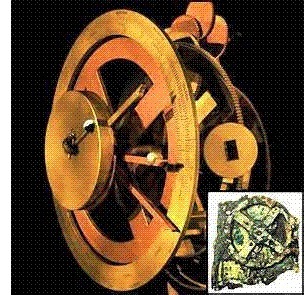 Antikythera Mechanism - The Antikythera Mechanism is a remarkable instrument, so named because it was found among the remains of a shipwreck off the Greek island of Antikythera in 1901. It consists of a series of complex gears made of bronze and is considered the oldest known computer (analog) in the world. Its function remained a mystery in the century since it was found, but just within the last few years has the mystery been cracked. Through extensive examination, it's been determined to be an astronomical calendar capable of tracking the movement of the known planets at the time. It's posted on the chart under Archimedes because he was thought to be its most likely builder due to his amazing analytical mind. However, this is not for certain, and the latest research indicates that it may have been built sometime after Archimedes lived.